CINCINNATI – The highly-anticipated debate next month between creationist Ken Ham and evolutionist Bill Nye has generated so much interest that tickets for the event sold out in two minutes. As previously reported, Ken Ham—president and CEO of the Christian apologetics ministry Answers in Genesis (AiG)—revealed last week that he will be debating Bill Nye “the Science Guy” next month at AiG’s Creation Museum, which is located near Cincinnati. Nye, who is the former host of the PBS children’s program Bill Nye the Science Guy, is an outspoken evolutionist who regularly equates Biblical creation to scientific illiteracy. 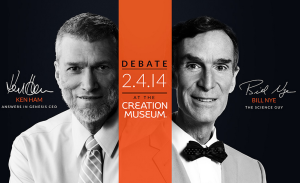 During the debate, Ham and Nye will focus on the question, “Is creation a viable model of origins in today’s modern scientific era?” The debate is scheduled for 7:00 p.m. on February 4th in the Creation Museum’s Legacy Hall. Last week’s initial debate announcement was met with enormous public interest, as numerous media outlets publicized the story and AiG’s website encountered record traffic levels. Then, when tickets for the event went on sale Monday, they sold out within minutes—even though the debate venue seats nearly 1,000 people. Since tickets for the event sold out so quickly, AiG spokespersons advise that they would like to stream the debate live. However, details are still being worked out for the online broadcast. The debate between Ham and Nye comes at a time when Americans remain sharply divided over the creation/evolution debate. According to a 2012 study by Gallup, 46% of people in the U.S. believe that “God created humans in present form,” which is a slight rise from recent years. The same study also shows that 15% of Americans believe humans evolved by natural means, while 32% believe in God-guided evolution. In an email interview with Christian News Network, Mark Looy—Chief Communications Officer for AiG—said the creation/evolution debate is an important one, since beliefs on life’s origins directly affect one’s worldview. The enormous response to next month’s debate demonstrates the public’s interest in the creation/evolution issue, Looy added. Ultimately, Looy hopes the debate between Ham and Nye will bring the message of biblical creation to as many people as possible.